Recently, an organization named I Live Here I Give Here (ILHIGH) took steps to acquire ownership of the term “Amplify” for fundraising efforts related to the annual giving day that began in 2013. Amplify Credit Union is a supporter of this program, including a role as a lead sponsor in 2016, and we have no desire to interrupt that good work. In addition to continuing that support, we must also protect our members’ assets, one of which is our right to continue using “Amplify” for our charitable initiatives, which we have done since 2008 shortly after becoming Amplify Credit Union. 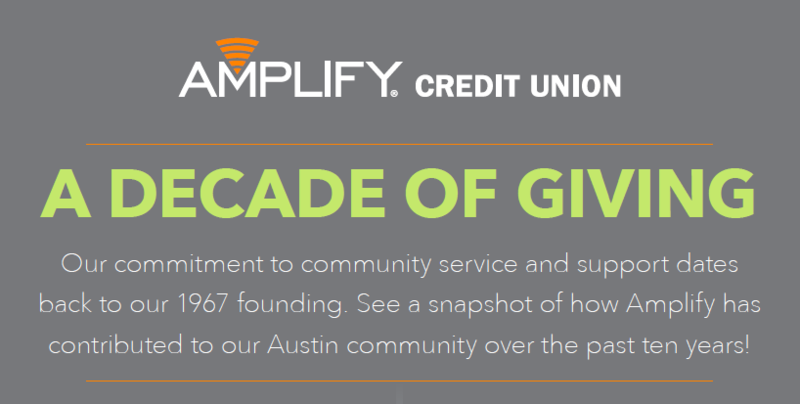 Read more about how Amplify has given back to the Austin community over the last decade. For those engaged in this conversation, we thank you for your care and concern for our community and would like you to know we share that commitment. In fact, to ensure ILHIGH’s work could continue uninterrupted, we have been in negotiations with the organization since Fall 2015 regarding ownership of the term “Amplify” and offered a royalty-free license to ensure ILHIGH could continue to use it unencumbered. In addition, we offered to promote the Amplify Austin giving day to our members, encouraging them to donate because we understand how crucial it is to our community. As a member-owned, not-for-profit financial cooperative, Amplify Credit Union has a duty to protect the assets its members have created – one of which is the trademarks Amplify owns, like this one – and we will fulfill that duty. In doing so, we will also continue to support the good work that ILHIGH does and remain ready to provide the organization a royalty-free license to ensure its work continues uninterrupted at no cost to them. We welcome any questions you may have about this matter and encourage you to direct them to Executive Vice President Kendall Garrison at kgarrison@goamplify.com.